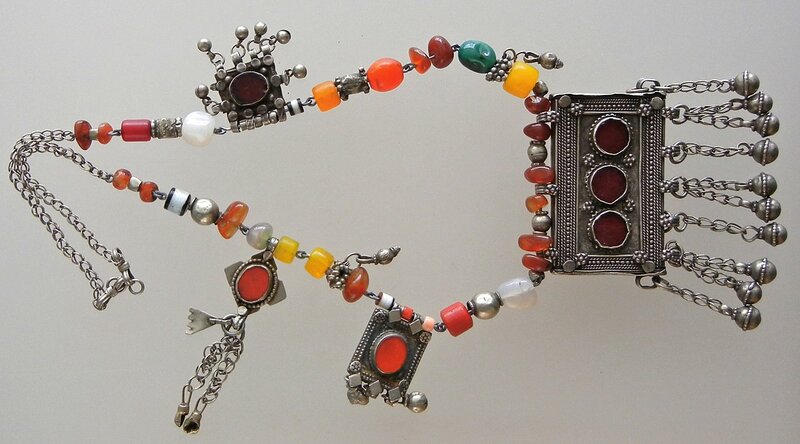 Moroccan silver jewelry, Berber, Tuareg, Yemeni coral, amber, glass, stone beads, silver jewelry. 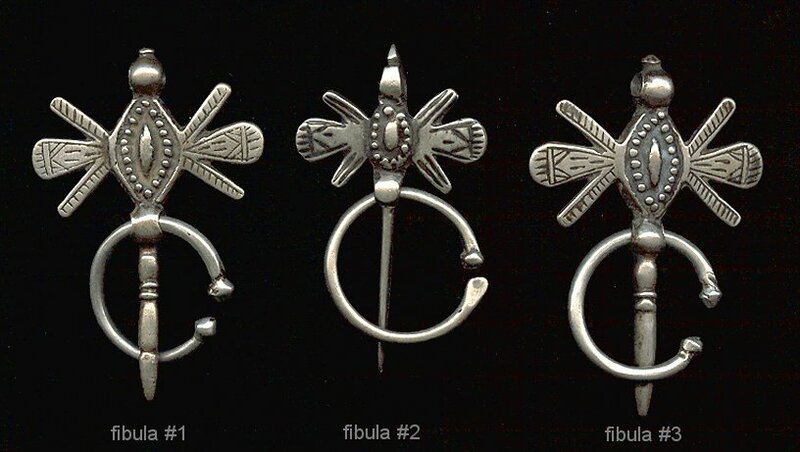 Khamsas, crosses, fibula. -This page has some serious editing issues now so any new North African items will be listed on the "AFRICA" page. 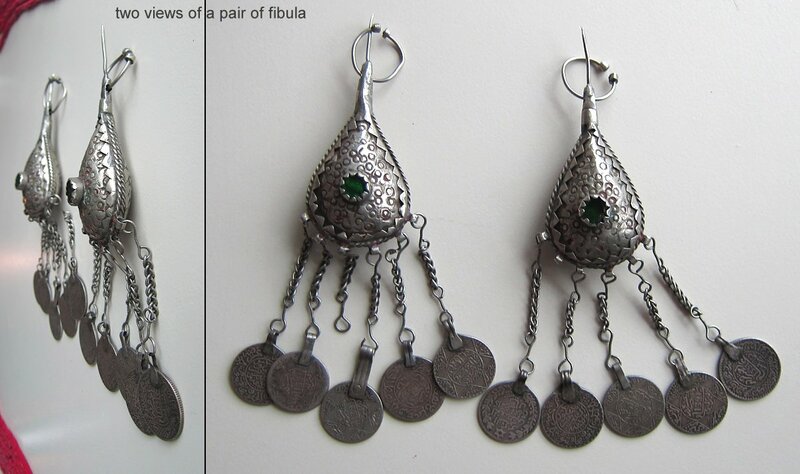 I am combining this page as well - with jewellery from YEMEN. 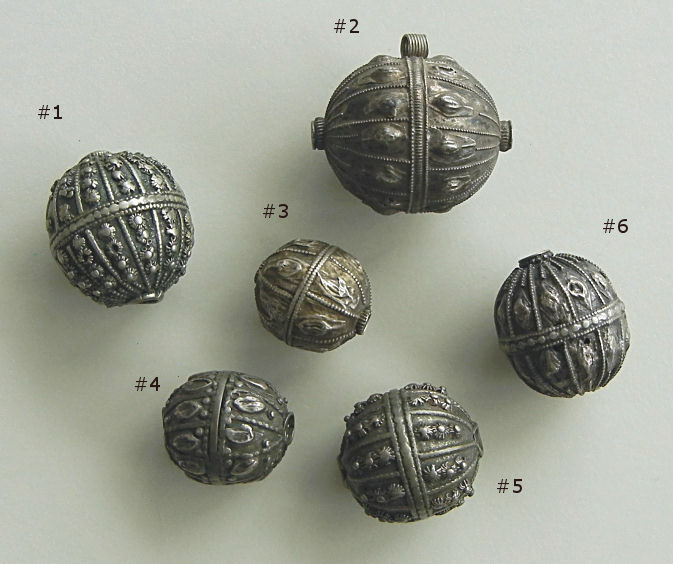 I do realize it is not on the same continent but there is a lot of trade between Yemen and Africa, and silver items are often exchanged. 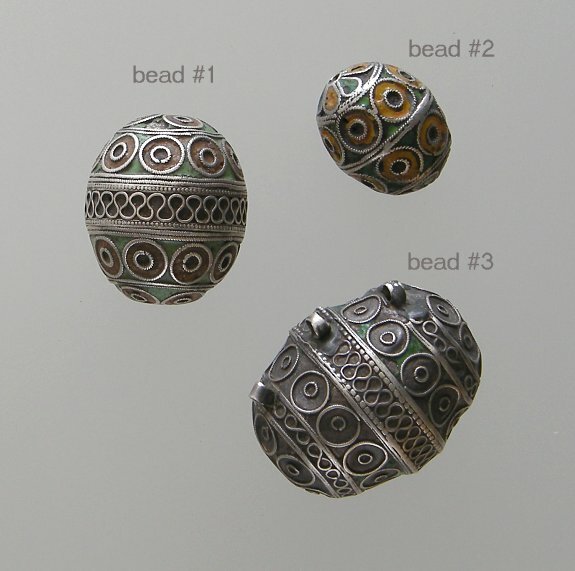 In the Yemeni necklaces (recently put together) North African pendants and beads are often included as are some pieces from Afghanistan as well. NAF451. This ring has the popular images on it just like on a deck of cards - 2 clubs and a heart in the middle. The ring is a size 8.5. $45.US. NAF452. Lovely antique Berber prayer box made of good silver and enamelled in a bright grass green with an ochre contrast. 2 1/4 inches wide. $275.US. NAF453. 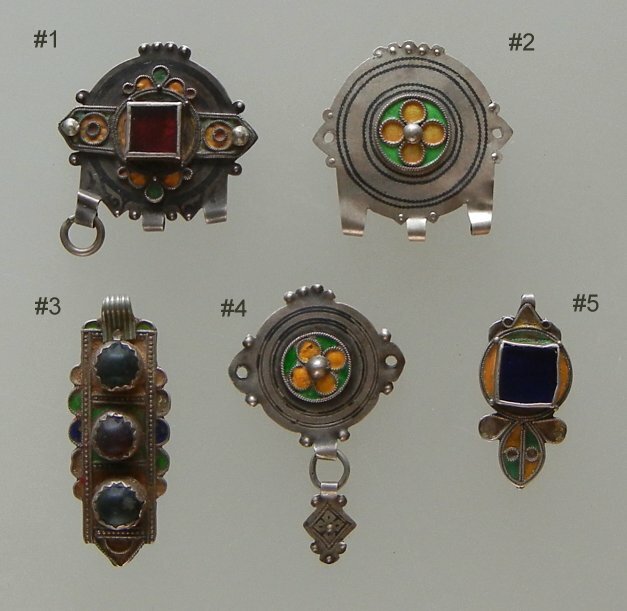 This antique Berber prayer box is a great pendant of good silver with muted enamel. It is 2 5/16 inches wide. An impressive pendant. $275.US. NAF454. A very attractive antique Berber prayer box of good silver with enamel. It is 2 3/16 inches wide and 1 5/8 inches tall and very memorable. $245.US. NAF455. Here is another antique Berber prayer box with cones reaching out. The enamelling is muted and attractive. It is 2 3/8 inches wide. $275.US. NAF456. These antique Berber prayer boxes convey their ages from their years of wear. This is good silver with muted enamel. It is 2 1/8 inches wide. $240.US. NAF459. Here is a Mauritanian bracelet that was originally meant for the ankle to chase negative enery away. It is 2 7/16 by 1 5/8 inches on the inside. $285.US. NAF408. 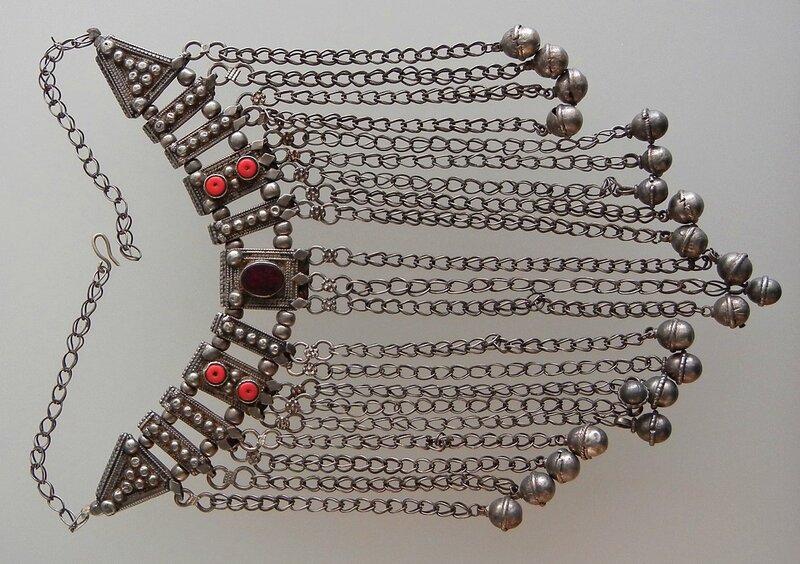 The complex part of this Yemeni necklace is 9 inches across on the inside. There is 10 inches of chain as well so that you can sit the necklace in the best place for yourself. The longest dangles are 7 inches long. The red decorations are glass with the outside ones imitating coral. $300.US/sale price $275.US. NAF412. 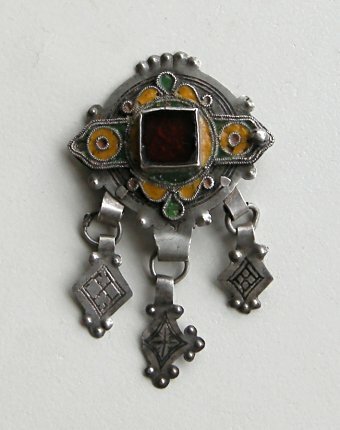 This Yemeni necklace has some Afghani components as well including the central amulet. 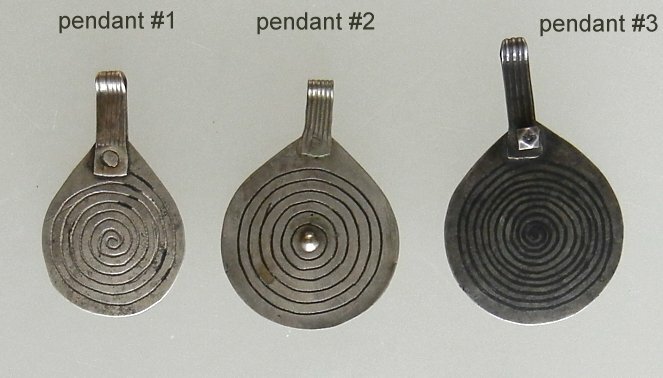 The pendant is 3 inches across and 4 inches tall including hanging loops and dangles. It is about 1/3 inch thick. The piece is strung rather clumsily with new beads including some amber imitations. The beads have wires running through them which don't always sit well, so the first think that I would do is restring the piece. It has great components to it... The necklace is about 29 inches long, and can be shortened to suit by changing the position of the "S" hook. $335.US/sale price $300.US. NAF419. 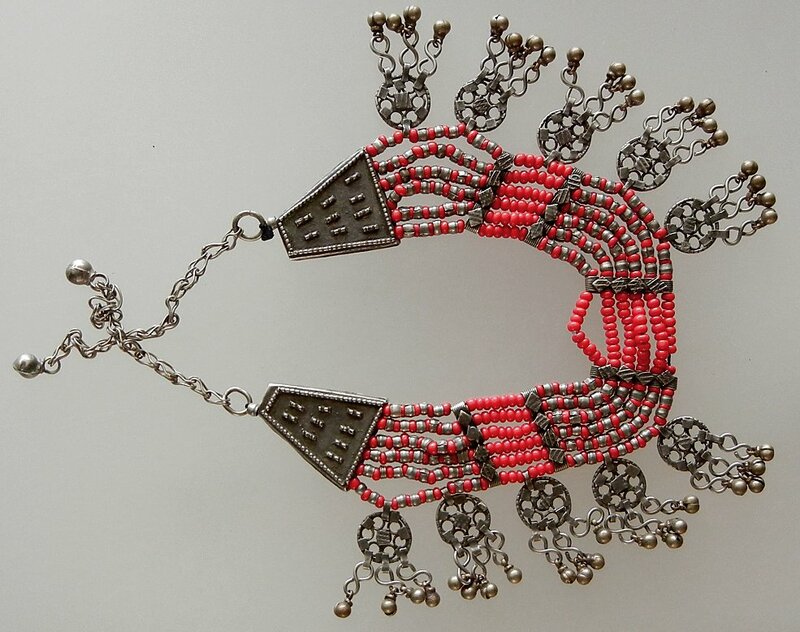 This Yemeni necklace is highly influenced by the Afghanis. 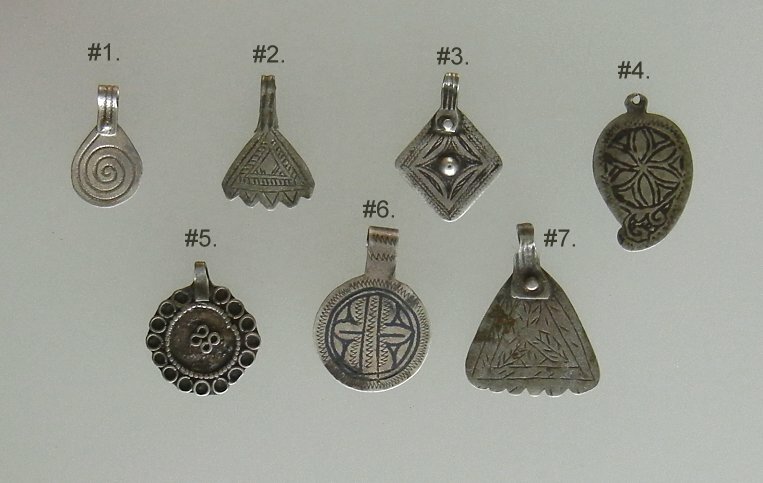 The central pendant makes me immediately think of that area with Turkoman and other pieces. The pendant is 4 1/2 inches tall and when you add the chains and bells it is 10 1/2 inches long. The decorations on it are glass with the smaller ones imitating coral. The chain is 20 inches long and can be adjusted. The necklace is very eye catching when worn. $425.US/sale price $365.US. NAF420. This is a very heavy Yemeni necklace though it has quite a delicate central pendant. 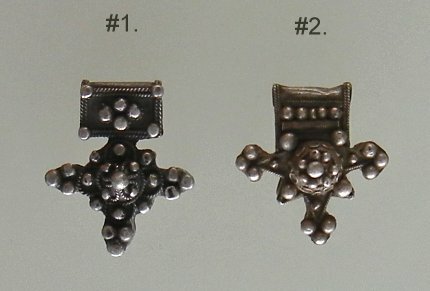 The different pieces are different grades of silver, ranging from sterling quality to coin silver but they all look good together. The central pendant with pink glass stones (some missing) looks as if it has been gilded. The inside of the necklace is 15 1/2 inches around. It does not have a proper clasp so is currently being opened by a loop in one piece of the chain. This is quite magnificent. 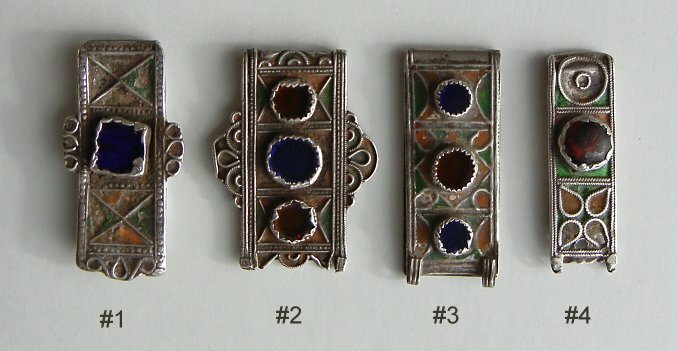 The central rectangular pendant with next one attached is 5 3/4 inches tall. $340.US/sale price $290.US. NAF422. This Yemeni necklace is made up of different grades of silver, all with a good colour to them. No two pieces match exactly as they were put together from a group of pieces. The red glass beads (a little more red than in the photo) represent coral. 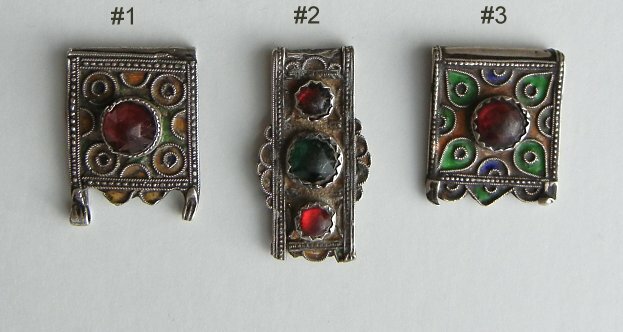 The decorative found pieces have facet red glass centers. 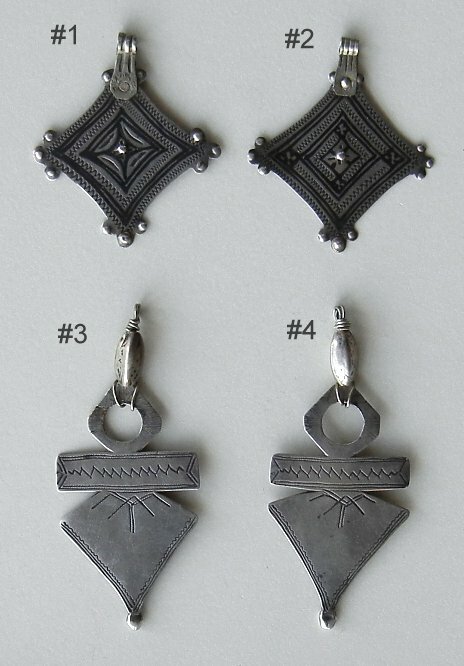 The front pendant including rectangle and amulet pendant is 3 1/2 inches tall. The necklace is 20 inches around. A clasp needs to be added to be able to open and shut it. $315.US/sale price $275.US. NAF423. 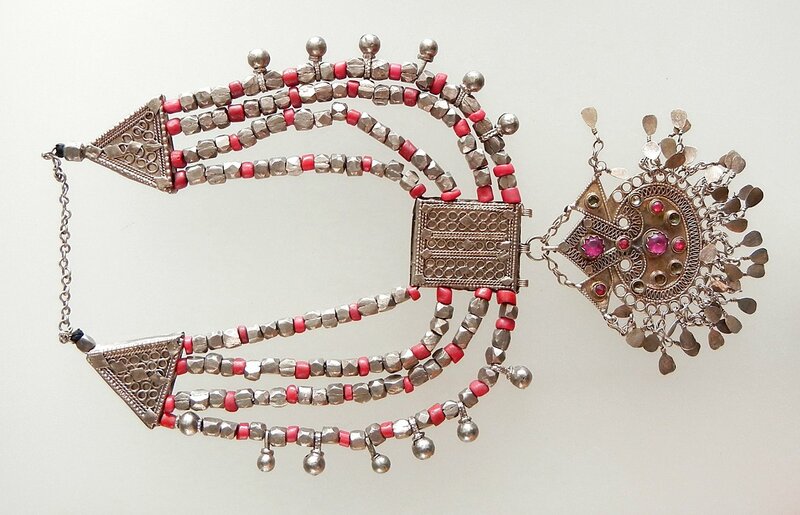 This is a gorgeous Yemeni necklace with beads of old silver and of newish rich red glass. The decorative inside of the necklace is 10 inches long and the entire necklace is 18 inches long and can be adjusted to length. This is a good solid piece ready to wear. $375.US/sale price $320.US. NAF424. 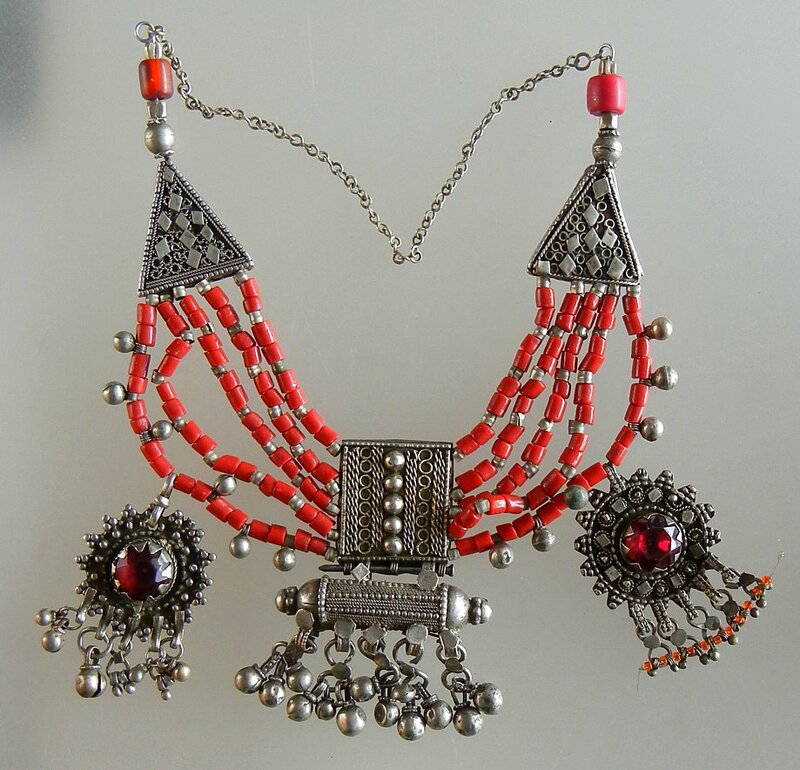 This Yemeni necklace needs restringing as it is in its original form. 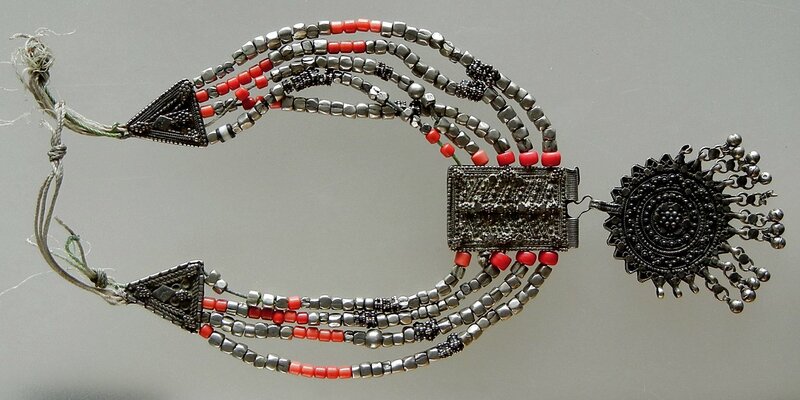 It is a combination of old silver with coral coloured glass beads. 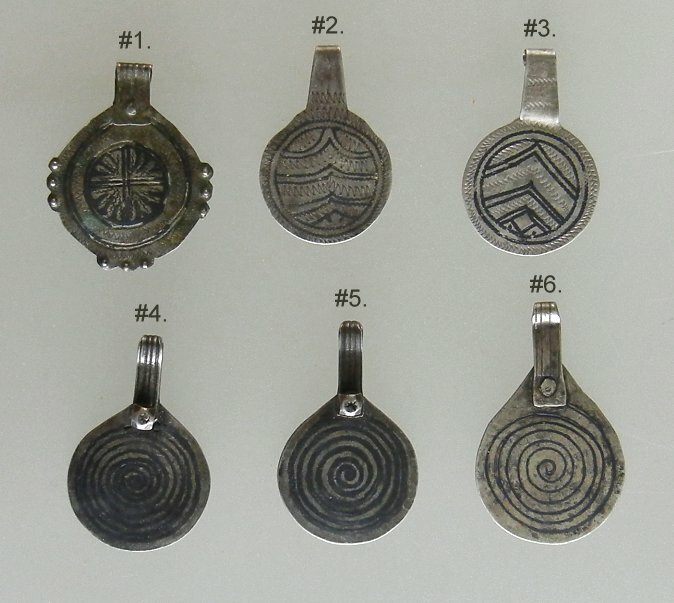 The central pendant including rectangle and disc below with dangles is 5 1/2 inches long. The inside of the necklace is 14 inches across plus cord... $360.US/sale price $310.US. NAF430. I wish that this dramatic bracelet was made of sterling grade silver but it is more of a mixed metal instead. It is a great looking individual piece and heavy too weighing in at 214 grams. The inside measures 2 inches by 1 3/4 inches with a 1 1/8 inch wide opening. $175.US. NAF434. 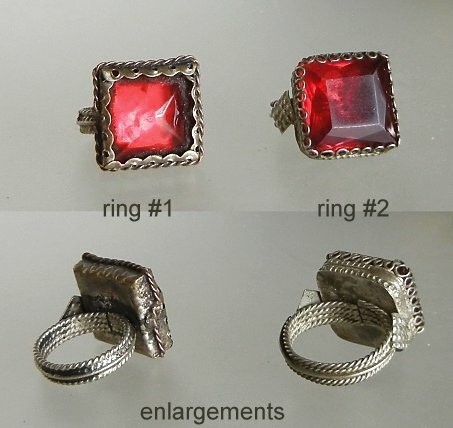 These two rings are made of low grade siver and glass facet stones. The glass is richer and darker red than it appears in the photo. Ring #1 is size 5.5. Ring #2 is size 7. $35.US/each. NAF296. This piece measures 20 1/2 inches long. 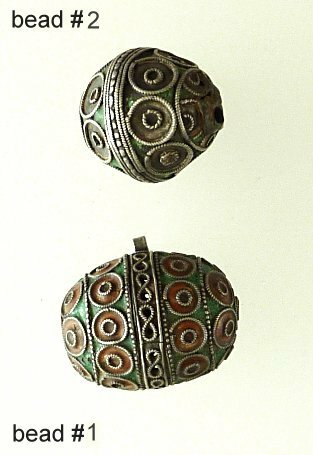 It is a combination of 2 fibulae (they have coral placed in the silver openings and the remains of enamel in green and orange in the dips of the design) with chains attaching them to beads. It is rather small and delicate and would work very nicely in a very decorative way on a sweater. 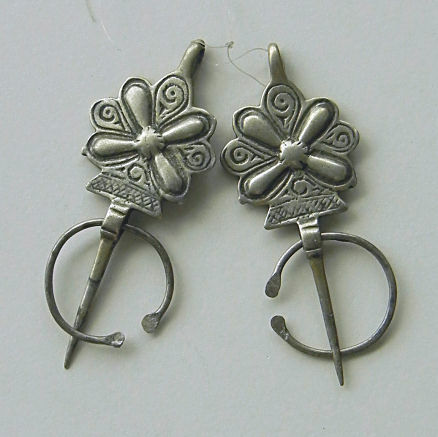 It is silver, and it is antique though I imagine the pieces have been attached in a new combination than in the past as the spring rings seem to be newer than the main pieces. $110.US. NAF314. 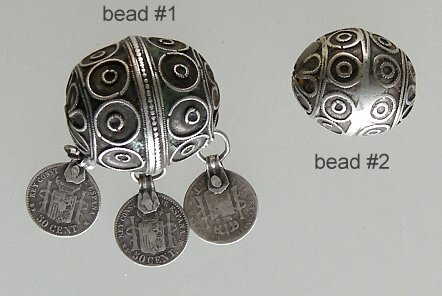 Pendants like this are often worn attached to earrings, or stitched onto a head-band. This is old and interesting and came from an old collection. The knob one one side of the central part is missing, leaving an opening that one can string through. The other knob has a loop at the back so you could use those two elements to suspend this piece. The center dangle below has one side clipped. It is still a good and attractive piece with the original enamelling and a square red stone set into the middle. This measures 3 3/8 inches from top to bottom. $95.US. NAF322. This is the heaviest Mauritanian ankle bracelet (khalkhal) that I have had - it weighs in at 105 grams of good silver. Because of its size it makes a great wrist bracelet though - it measures 2 3/8 by 1 3/4 inches on the inside and the opening is 1 inch wide. The anklets were worn to dispel evil spirits, to walk safely as well as to look attractive. 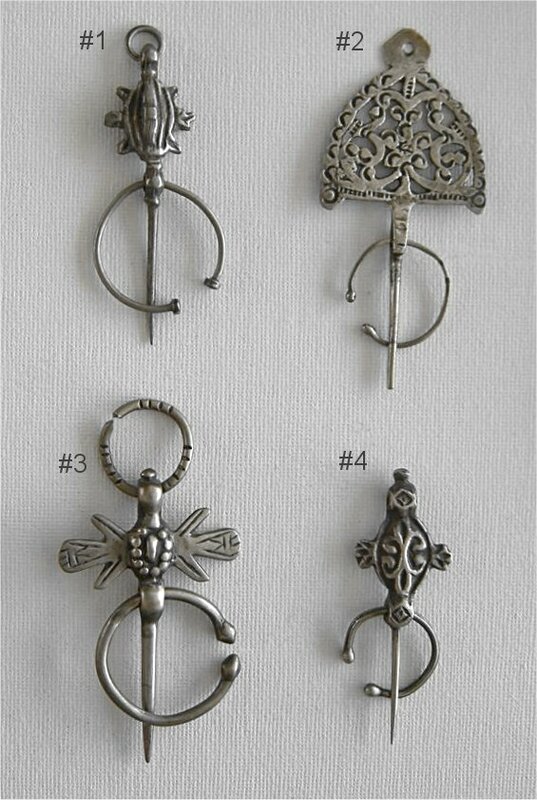 These were originally worn by the noble women but there are versions now for everyone. This is an authentic antique piece (modern ones are being made and sold as antique at times) and has been banged around a few times which gives it the look of age. The intricate decorative rectangle is 1 3/8 by 1 3/16 inches and the solid silver balls at the back are 3/4 inch in diameter. 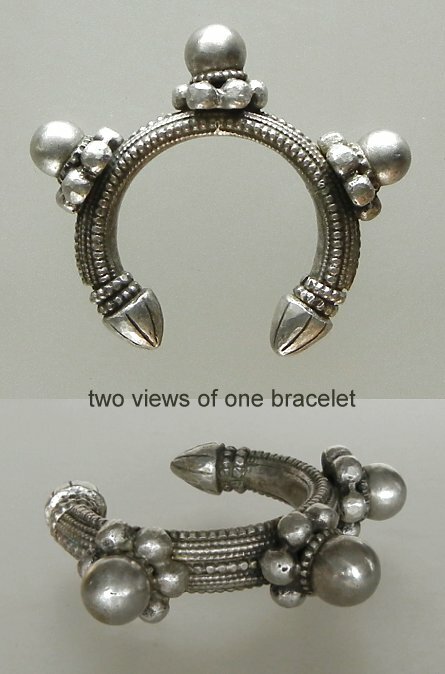 See page 35 of "A World of Bracelets". $550.US. NAF346. Pendant #1 is 1 3/4 inches tall - $80.US. Pendant #2 is 2 1/8 inches tall - $78.US. 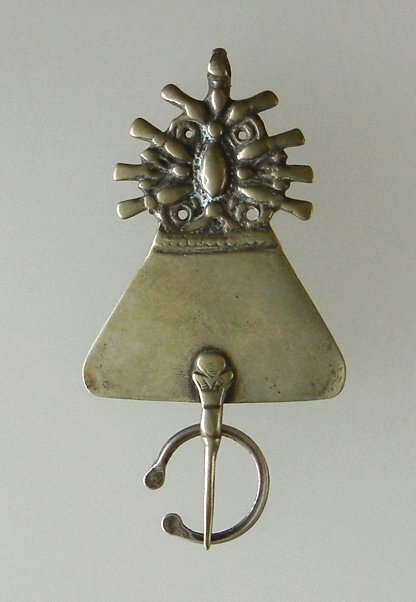 Pendant #3 is 1 5/8 inches tall - $64.US. NAF358. 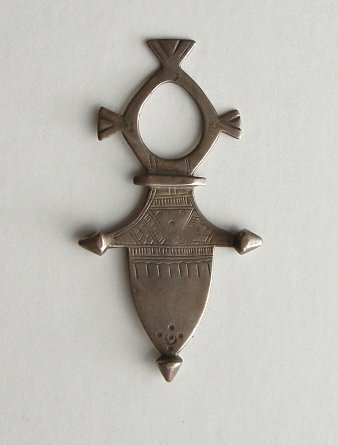 This is a very attractive antique Tuareg cross, 3 1/8 inches tall. It has been worn, and the pattern is lightly softened from wear. $115.US. NAF377. 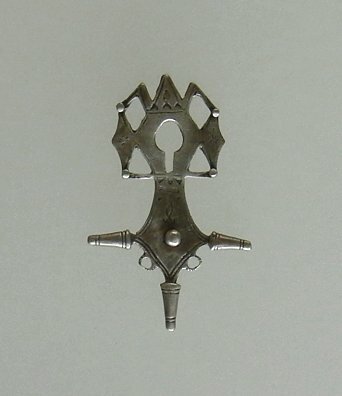 Here is a more complex Tuareg cross measuring slightly over 2 1/2 inches tall. 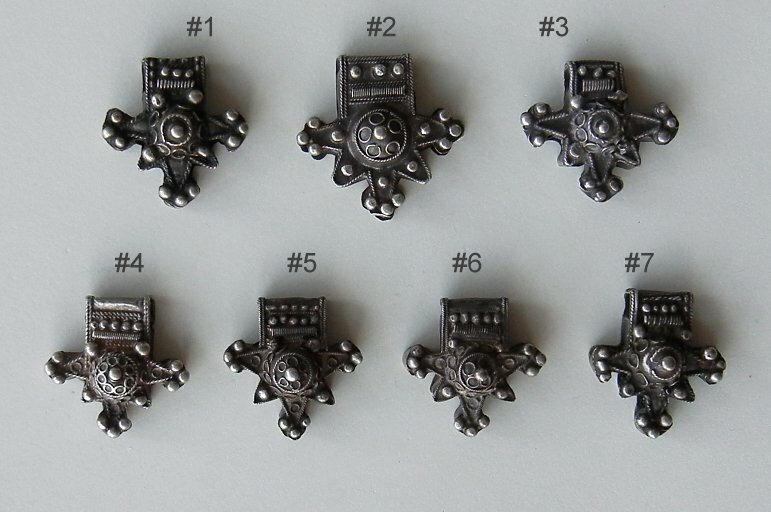 The silver piece in the center actually stands up about 1/5 inch tall. The two hanging looks at the sides of the bottom part are quite worn from the years gone by, but are still useable - carefully. $105.US. NAF378. These two coin pendants are $45.US each. 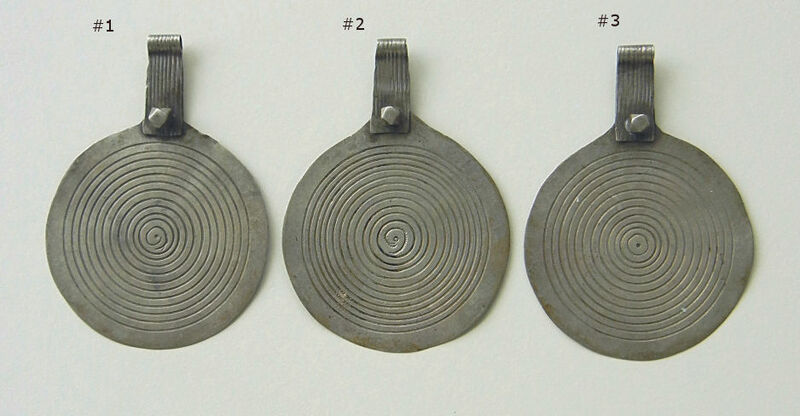 #1 is soldered so that the pendant is permanently fastened to the coin (1 5/8 inches tall) but the coin on #2 can be turned to straighten or push it to an angle as it is in the photo. NAF379. 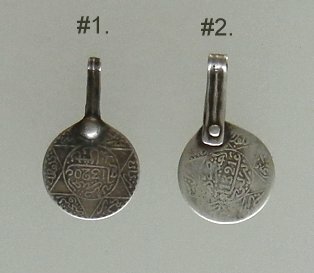 These silver coin pendants (actual coins) have come out of Morocco. 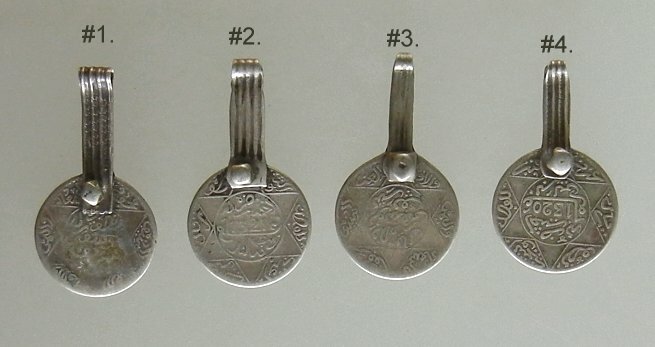 The coins measure 1 1/4 inches in diameter. The entire piece of #1 is 2 1/4 inches tall. #1 & #2 are $75.US each. #3 & #4 are $70.US each. NAF382. 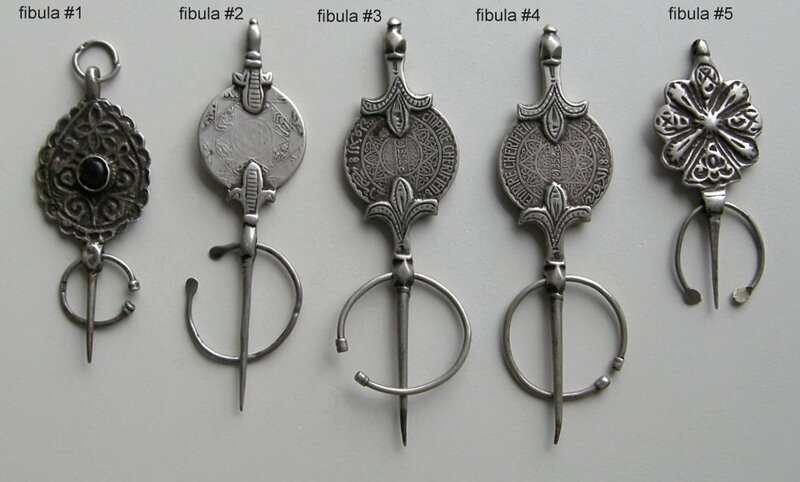 This fibula has a mix of silver and bronze in it to give it a rather warm colour. It is 5 inches tall. $115.US. NAF390. 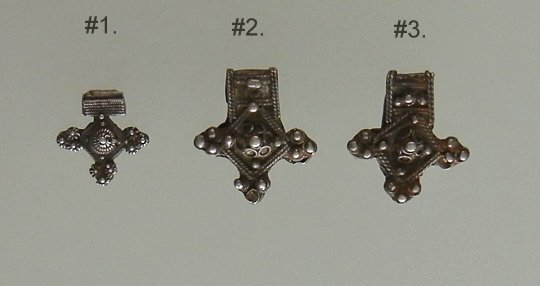 Small Moroccan silver crosses - #1 is under an inch tall - $28.US. #2 is just under 1 3/8 inches tall - $65.US. #3 is just over 1 1/4 inches tall - $65.US. NAF394. 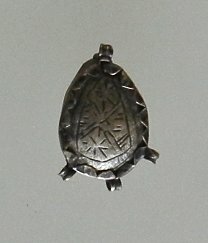 This is a fat, double sided earring piece missing pendants or ear hook. It makes a great pendant. It is just under 1 1/2 inches tall. $38.US.